of a struggle to remain calm. over and drown out common sense. lie in the grey area between sanity and madness. to ward off any injustice of a knee-jerk reaction. Perhaps you’re thinking I don’t give a damn. and hasten to justify or explain in haste. before escaping into comforting panic or supposition. or losing one’s head– is always counterproductive. *(I am including the following reference to this excellent childrens’ book because it is also paraphrased for the title of this post.) There is a childrens’ book that I have always liked, and in fact have quoted from it frequently. My kids may have had the book, or we may have gotten it from the library….way back in the day! 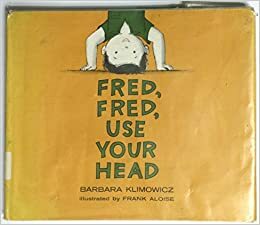 The name of it is Fred, Fred, Use Your Head, …written by Barbara Klimowicz and illustrated by Frank Aloise… published in 1966 by Abington Press. Fred is a little boy who learns to think before he leaps into anything, thereby saving him from jumping to conclusions or questionable activity. One of the best of yours I’ve read of…..and I do remember the little book…’Fred,Fred……’. Definitely these are words to live by! It seems to me that your poem is the definition of irony. The truth behind the spilling coffee. And the truth behind that. Thank you!